And, despite the title not mentioning it, there is actually cream cheese on it too (I didn’t want to make the title ridiculously long). 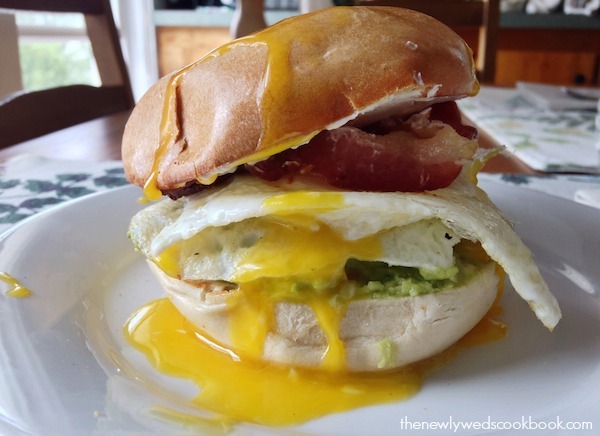 If you can think of a better name for this breakfast sandwich, I would really love to hear your opinion because I couldn’t think of anything creative enough! 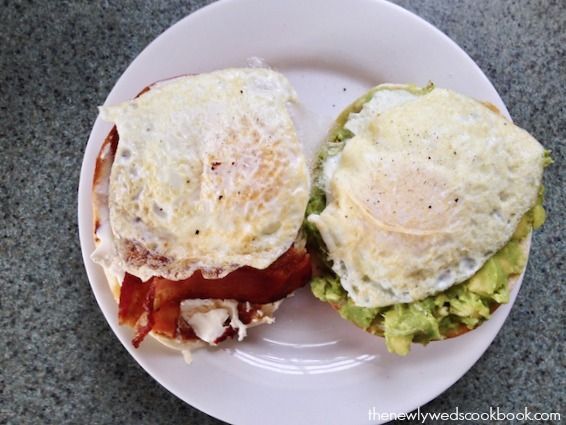 This bagel is packed full of an entire half of an avocado, bacon, fried eggs, and cream cheese. Holy moly, yes! Do you want this right now or what?! *Again, I am not listing amounts because it is completely up to you. Maybe you want just a small amount of cream cheese, maybe you like to cake it on there (like me)! 1. Place the bacon on a skillet and let it cook on low. I always start the bacon first and let it cook on low heat before I start anything else. 2. In the meantime, you can mash up your avocado with a spoon. 3. Place the bagel on the skillet, (or throw it in the toaster). 4. 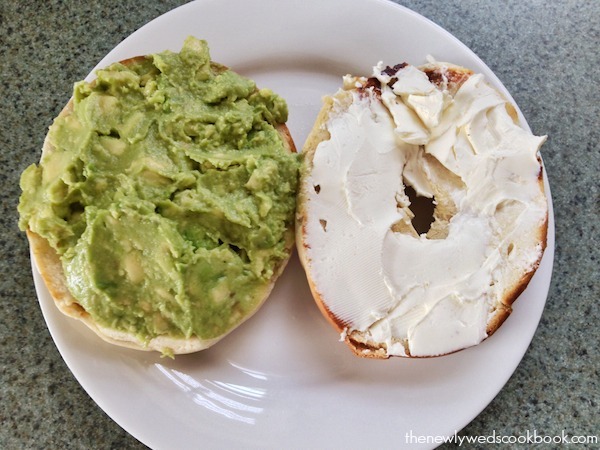 Lather one side of the bagel with the mashed avocado, and the other side with the cream cheese. 5. 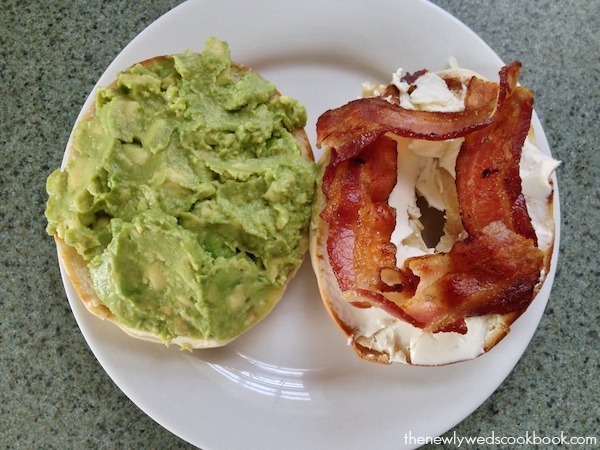 Once your bacon is cooked, place it on the bagel. 6. Cook the fried eggs last because they take the least amount of time (I made two). Cook them to your preference, my husband likes his very yoke-y. 7. 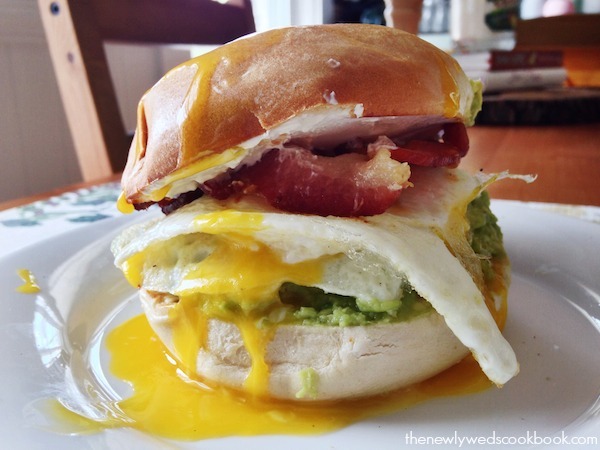 Place the eggs on the sandwich, sprinkle on some salt and pepper and close the bagel sandwich up…if you can. 8. Grab some napkins and enjoy!